Western blot analysis of extracts from NIH/3T3 and Jurkat cells, untreated, PDGF-treated or LY294002-treated as indicated, using Phospho-Akt (Thr308) (C31E5E) Rabbit mAb (upper) or Akt (pan) (C67E7) Rabbit mAb #4691 (lower). 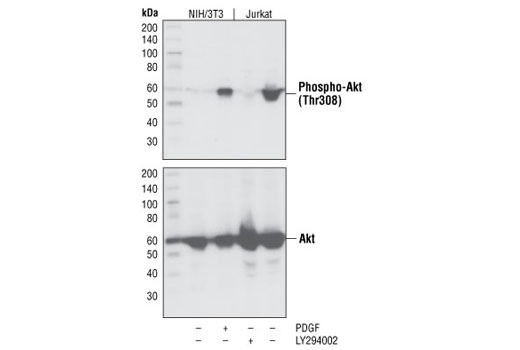 Phospho-Akt (Thr308) (C31E5E) Rabbit mAb detects endogenous levels of Akt only when phosphorylated at Thr308. Monoclonal antibody is produced by immunizing animals with a synthetic phosphopeptide corresponding to residues around Thr308 of mouse Akt.